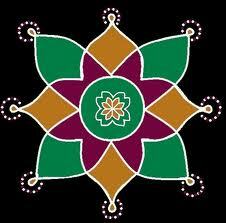 I have been looking at your blog for kolams for a while, and yesterday I was inspired and drew a kolam in my backyard. You are so creative!!. How do you draw these designs and put it up? Thank you for posting these kolams. Thank you for your comments. I used to draw in paint and upload it to my site.